Retrospective Documentary, Best Bits, Never Before Seen-On-TV Sketches and more! He captured the hearts of million viewers worldwide and has been called the most embarrassing man on earth. He is the character who everyone wants to help out of his sticky situations, but nobody would invite for tea. Behold the man who is a bean, Mr. Bean! Starring award-winning British comedy genius Rowan Atkinson (Blackadder, Johnny English, Mr. Bean's Holiday and Bean), internationally acclaimed TV series MR. BEAN, two box office hit films and animated series continue to enthrall audience worldwide and maintain universal popularity. 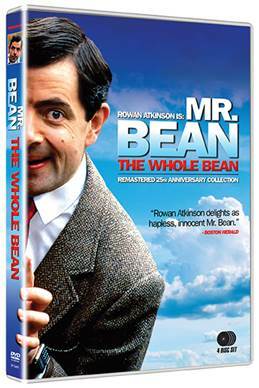 On March 24, 2015, Fabulous Films will release MR. BEAN: THE WHOLE BEAN 25th Anniversary Collection 4-DVD set. This highly anticipated 25th Anniversary Collection DVD set contains all 14 laugh-out-loud episodes of the beloved series, recently remastered. Special bonus features include previously missing scenes from the original U.S broadcast, a 40-minute documentary, the best bits of Mr. Bean and much more that will complete your Whole Bean. MR. BEAN is a series of 14 original TV programs based around the character of Mr. Bean, a grown man who seems to have been born yesterday. Aided by his best friend Teddy, Mr. Bean stumbles from one mishap to the next, always finding complex solutions to the simplest of problems. He creates his own messes and delights audiences with his uproarious facial expressions and physical comedy. The first episode of MR. BEAN premiered on January 1, 1990, in the UK, and ran on the ITV network until October of 1995. During its five-year run, the series gained large UK audience figures, including 18.7 million for the 1991 episode "The Trouble with Mr. Bean." 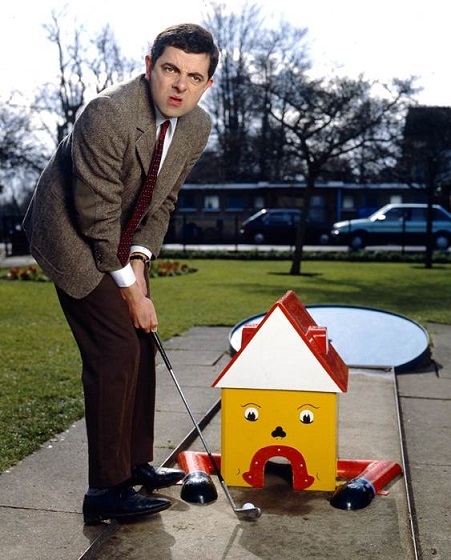 The MR. BEAN series has been sold to over 200 territories worldwide and has won an International Emmy®, a Banff World Television Award and the Golden Rose of Montreux. With the original series, starring Rowan Atkinson, feature film and an animated series, this quirky and evergreen brand is laughed at and loved on a global scale. · Never Before Seen-On-TV Sketches "bus stop" and "library"